I have elected to share all the messages and communications which have been directed at me by Those Who are called The Great White Brotherhood and The Ascended Masters of Earth's Spiritual Hierarchy. This includes the critical along with the complementary to demonstrate that the personality called Doctor Jim is as humanly flawed as any other, if not moreso. I've withheld nothing in the spirit of full disclosure so that all may judge for themselves the type and quality of guidance that I've been given to initiate and then proceed on the path that I had pre-incarnatively planned before entering this earth life. The primary vehicle that The Masters have chosen to bring the messages through, on my behalf, is one Gregory Lee Paul whom I've known since the late 1950's, when our paths were designed to cross for this very purpose in the distant future when both of us would be ready and prepared to do our part for the Plan of Sanat Kumara and The Spiritual Government of Planet Earth (refer to "Who Is Sanat Kumara?" and "Who Are The Spiritual Hierarchy?"). 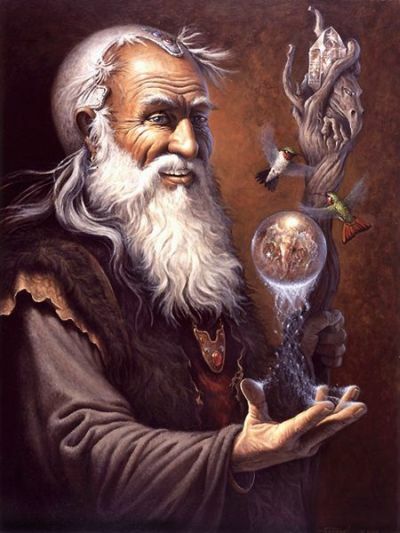 Greg had been well trained in the Astral Temples between physically-incarnate lives to be consciously and telepathically receptive to the High Levels from which Ascended Masters would be communicating. He recognized his "gift" in childhood when he could get his personal questions and perplexities of life answered by asking within for the answers and thought that everyone had the same guidance system available to them, although he never discussed it openly and thought that perhaps "God" was responding to his childish queries. Spontaneous and uninvited messages were included when his life circumstances were in need of them. He took them all in stride throughout his life, thinking that it was normal for everyone to have such lofty and divinely-inspired guidance available to them. Of course, Soul guidance is available to everyone, but few have established a clearly open and conscious connectivity to that Source of their being by building the Bridge of Light from the brain and the lower, concrete mind to the higher, abstract mind of the Soul (the Bridge called Antahkarana). And The Ascended Masters are The Teachers of our Souls, so it's a Level of Consciousness that is considerably higher in perspective and knowingness (click on "What Is An Ascended Master, Anyway?"). I was not even aware of Greg's ability until later in life when I began sharing some very esoteric matters with him, including my expanding knowledge of The Great White Brotherhood (see "The Ashram Of The King") and my involvement with Them (thanks to friends with far greater psychic sensitivity than my own). He then opened up and explained his capabilities held in secret for most of his life, and that is when the flood gates seemed to open and the messages started to pour forth for the first time for someone besides himself, namely me. The moment had arrived, as deemed appropriate by The Brotherhood, and Greg increasingly began serving as a medium or intermediary between certain of The Masters and myself. The more committed I became toward following the path of my destiny for this life, the more information that Greg received for me and the more he was made aware of The Originating Source of the communications. His means of receiving messages also started expanding in a variety of ways. His mind had always been able to be telepathically impressed from On High, but now the reception came also as visions granted, clairaudience, heightened intuition, chills and gooseflesh phenomena, tearful watering of eyes, sudden knowingness, and great thought-packages being "downloaded" into his mind. It was as though, once I had utilized my free will in choosing to learn of occult, metaphysical matters and Greg had used his free will to choose to help me, the Heavens opened up and divine guidance began to freely pour forth, which would be in keeping with the free-will directive for this evolutionary scheme (never violated by The Masters). Some may wonder why I don't receive these things directly myself, but the protective shield I have (as created by The Forces of Light) effectively inhibits such telepathic interplay, and anything that does come through to my right cerebral hemisphere is switched over so immediately to my left brain that the thought seems to me to have originated in my own mind, the mind of the personality (due to over-developement of the analytical left brain during the educational process to become a physician). The Higher Ups know this and use other people to get through to me. I have kept all these messages in quotation marks because nothing has been changed from its original delivery. If a word was modified for clarification sake, it was always approved by the channel, Greg. Word emphases by underlining and capitalization were done by Greg to reflect emphasis by The Masters in the message. Boldened font was done by me in honoring and respecting The Loving and Compassionate Great Ones Who remain with Earth's Evolutions in a sacrificial act of great magnitude, and I have underlined a very few words that I felt required emphasizing. Honesty was considered essential in organizing all these communications, and Greg reassured me that I would get only truthfulness from him as he translated the thought-forms into the linearity of language. Knowing him as I do, I have no doubt in his integrity in accurately passing along to me all the things that The Initiate Brotherhood wanted me to know about, including the deserved "tongue-lashings" that I received. I offer this inside look into my journey on Earth for a number of reasons. I want more people to become aware of The Ascended Masters to reach out to Them for help and guidance and to become recipients of Their Light for the sake of Planet Earth and Humanity. I want to reveal what They have to say about my work so that more people will take advantage of the opportunity for healing, will expand their consciousness to become capable of making the Dimensional Shift on this planet (click on "The Dimensional Shift Of Earth"), and will become enthusiastic supporters of the Sanctuaries of The Masters (see "The Sanctuary Of Kuthumi"). I want people to know of my frailties and drawbacks to understand my honesty in offering a full disclosure so that there isn't a skeptical/cynical response to the many other fantastical things revealed. I'm hoping that this section of my website will broaden the narrow perspectives of readers who are imprisoned by the mundane illusion and shackled to the false doctrines of religiosity. I seek to widen horizons, raise awareness, dispel erroneous ways of thinking, gather the flock to the fold, and promote the agenda of The Greatest Benefactors the world has ever known. I think that lastly I should mention that most mediums who claim to be channeling The Ascended Masters (and who believe it) are tapping into ideas and thought-packages contained within the vast thought-forms of those Masters on the Astral Planes, not The Masters Themselves. These thought-forms have been emotionally constructed for millennia by human disciples in incarnate state. Most mediums have astral sensitivity and connectivity through the Solar Plexus Chakra (and feel it in the gut, the lower form of psychism). I have studied these channelings here and lost count of the number of times I've read them. I've concluded that Greg is the real thing and that the messages purportedly from Masters of our Spiritual Hierarchy have come from that Exalted Realm of High Estate, which is far beyond the Major Astral and Mental Planes. I'm humbled and grateful for Their participation in my mission and my life. Greg has left his body behind and has moved on beyond our Dense Physical Plane as of June 2018, consequently there will be no more additional entries into this compilation of his messages for me from The Sons of the Fire Mist. His work and his vision has expanded, and The Brotherhood have welcomed him back Home.